#ATD2016 is the biggest learning and performance event of the year. With more than 10,000 L&D pros from across the globe in attendance in Denver, Colorado and an expo the size of 2 football fields, it certainly felt like it! 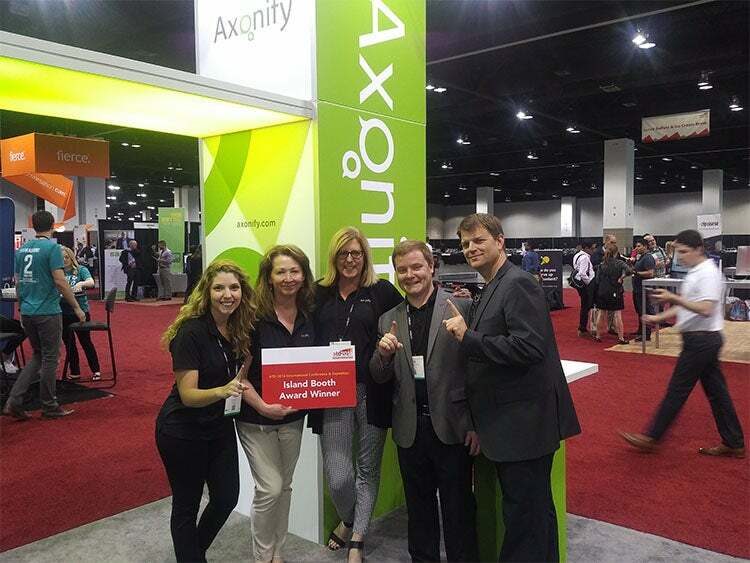 Our Axonify team was on the move throughout the conference. Carol Leaman and I presented 4 ideas for restoring relevance to L&D. The team had countless great conversations and met plenty of amazing people. We hosted a fun cocktail reception for our friends and partners. We were also honored with the award for Best Island Booth during the expo, thanks to our display as well as the friendly and informative support we provided to attendees who stopped by. With so many people engaging in so many conversations during so many sessions, you’d think it would be super difficult to narrow the emergent themes to a short list for this blog post. And it was—at least at first. However, after a few conversations, a 3-hour plane ride and a good night’s sleep, I landed on 4 core themes to summarize #ATD2016. The idea of embracing vulnerability was prominent throughout the conference. In my Escape Extinction! presentation, I spoke about the inherent vulnerability required to support continuous learning in the workplace. To learn, we must first be vulnerable enough to admit that we don’t know and we need help. This is often a sticking point for organizations that are culturally afraid of failure and may therefore look down upon—or even punish—a lack of knowledge rather than frame it as a learning opportunity. Keynote speaker, Brene Brown, echoed this idea. She discussed the nature of trust and vulnerability as it relates to organizational leadership. To quote “Vulnerability is not weakness. It’s our most accurate measure of courage.” I believe this same courage must be supported within our organizations to promote continued learning, strategic agility and performance improvement. Brown was simply amazing! She connected with the audience in a very natural, unassuming way and effectively layered storytelling, research and humor. Check out her popular TED Talk ‘The power of vulnerability’ to get an idea of what it was like to attend her keynote presentation. Several sessions focused on learning technology. In one session, the presenter began by asking how many people like their learning management system (LMS). Zero of a possible 300 hands (2 per person of course) went up. This sentiment was echoed during many conversations throughout the event and it isn’t new. (I can empathize from my years within corporate learning). However, L&D pros now have an even stronger understanding that right-fit technology is needed to support modern workplace learning. They are looking for technology that not only pushes content at their audiences, but also allows employees to pull information on-demand when problems arise on the job. This technology must adapt to the needs of each employee and provide actionable insights into learning and performance within the organization. The good news? This technology exists! The L&D community must keep asking questions and realize that there are better options out there (such as Axonify) to support the knowledge needs of today’s employees. Complaining about legacy tech isn’t enough. It’s time to take action and leverage tools that are built for the modern workplace. While sessions on an array of topics were well-attended, much of the chatter centered on formal training concepts, including eLearning authoring software, PowerPoint, leadership development and instructional design. Formal training tactics are and will continue to be an important part of workplace learning. However, as research has shown, traditional training isn’t enough. L&D pros must shift mindsets and become connectors first, creators second. They must embed learning in the workflow and help employees share their knowledge to truly scale workplace learning. Our formal training offerings can then become a more strategic way to support the organization’s learning ecosystem. The evolution has begun, but we still have a ways to go. While there are certainly conversations taking place regarding big picture workplace learning, they can still be drowned out now and then by the more familiar discussions of tools and instructional strategies. Of course, in the case of #ATD2016, this chatter may have been the result of who was in attendance and the roles they currently play within their L&D teams. What do you think? 4. Community is more than an event. I’m always energized by the opportunity to spend 3 or 4 days immersed in the world of L&D with people who are as passionate as I am about helping people do their jobs better. That said, it is only 3 or 4 days. What about the rest of the year? After all, community is more than an event! Too many L&D pros wait for these scheduled IRL (in real life) moments to engage with the larger professional community. Then, they go back to work and get overwhelmed by projects and deliverables. Meanwhile, their organization is trying to solve the exact same problem that many others face,but going at it alone. This isn’t a matter of time or money. It’s about effort and commitment. L&D pros must engage continuously with the community for their own development as well as the betterment of their organizations. We have tools like Twitter, Slack, Blab, Google and LinkedIn. We have professional organizations like ATD and the eLearning Guild. Let’s take advantage, create personal learning networks (PLNs) and dedicate the same amount of effort into improving ourselves that we put into improving our organizations. Everyone will benefit! There are my 4 big takeaways from #ATD2016! Thanks to everyone with whom I had the chance to interact at the show. It was a great event! If you were in attendance in Denver, what did you think? If you didn’t attend, I highly recommend keeping an eye on the #ATD2016 hashtag on Twitter so you can review the various recaps and perspectives that are being shared as your peers return to work.